I added 1/2 tsp. of coconut flavoring because I thought the dough didn't taste like much of anything. The end result was pretty good. Very soft, like I like 'em. Flavor was okay. MADE A QUICK BATCH AND GOT RAVE REVIEWS FROM MY WHOLE FAMILY...ESPECIALLY MY YOUNGER SISTER, WHO IS VERY HARD TO PLEASE. I absolutely LOVE this recipe! 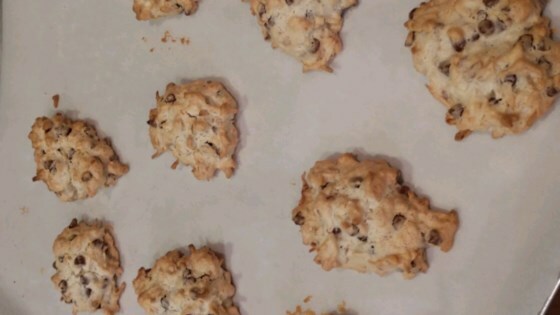 Everyone in my family raved about these cookies - I already have requests for another batch. Just be sure to use good coconut for premium moistness. YUM! These cookies taste/look like plastic. Sorry but, they really are not good. These are a little bland. I added some salt to my second batch and it helped a lot. I may add some coconut extract next time. They were easy and delicious. We made these gluten free by using rice flour and xantham gum. It's a great recipe to make gluten free. Yum! I agree there was not enough flavor and too many nuts. Maybe I'm just comparing it with the Magic Cookie Bars recipe, they are far superior. This falls flat.